With this year’s Maryland Deathfest only recently in the rearview, it’s already time for news about MDF 2017, as the first round of bands for next year’s metal fest par excellence have been announced. 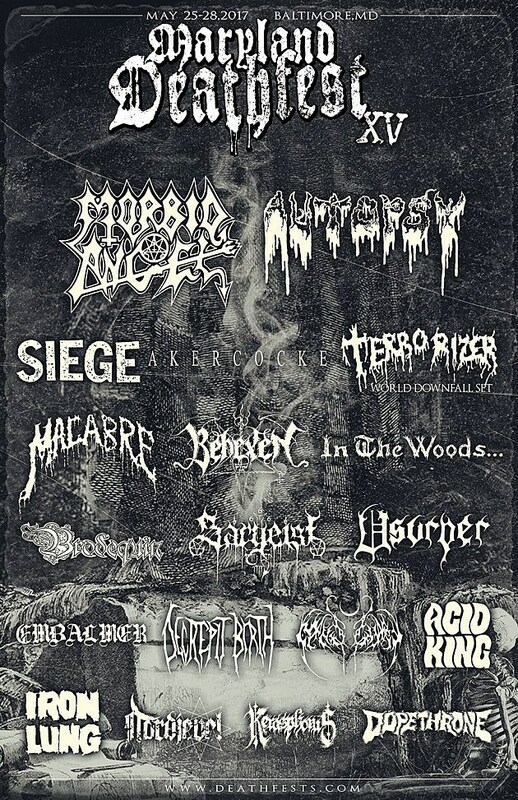 Going down on May 25-28 in Baltimore, it’s already shaping up to be a great fest, headlined by the double-barreled classic death metal of Morbid Angel and Autopsy. We also get Acid King, Siege, Terrorizer, Akercocke, Behexen, Sargeist, Embalmer, Dopethrone, Usurper and more. Early bird tickets have already sold out, so stay tuned for more news on that front. Check out the full initial lineup below. Akercocke (UK) – Exclusive U.S. appearance! Behexen (Finland) – Exclusive U.S. appearance! In The Woods… (Norway) – Exclusive U.S. appearance! Sargeist (Finland) – Exclusive U.S. appearance!